J.R. Currie first designed this ultralight biplane in England in the 1930's. Two were built by Cinque Ports Aviation Ltd with 40hp Aeronca-JAP J-99 engines. The first was flown in November 1937. Unfortunately both were destroyed by German bombing in 1940. 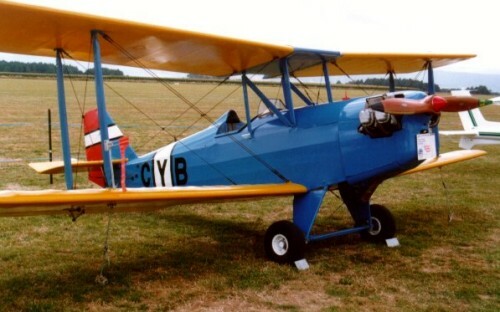 The designer was encouraged to reproduce the plans for the aerobatic biplane in 1958, and an example was built by the Hampshire Aeroplane Club. The first post-war example featured the 40hp Aeronca-JAP J-99 powerplant of its predecessors, but subsequent models used 26 hp VW, 55hp Lycoming, 60-65hp Walter Mikron, and even a 70hp Rover TP60/1 turbine engine. Six aircraft were produced by Slingsby Sailplanes in 1967 and modified to represent SE5a fighters for movie work.